Clarifying misconceptions about evidence-based practice is the first step to reducing professional resistance to it. During the past 10 to 15 years, there has been an increased focus in the behavioral health community on delivering what is known as evidence-based practice (EBP). Some of those practices, such as motivational interviewing and psychoeducational-supported employment, are now common practice in many behavioral health settings. Yet EBP is not as widespread as proponents would like and still faces resistance due to a number of factors, including a basic misunderstanding among behavioral health professionals of what EBP actually is. According to Haluk Soydan, PhD, director of the Hamovitch Center for Science in the Human Services at the University of Southern California School of Social Work, part of the misunderstanding is due to the fact that the term EBP is often used to refer to two related but different things. Despite the confusion—or perhaps because of it—EBP has become something of a buzzword in the behavioral health community. According to Joan Levy Zlotnik, PhD, ACSW, executive director of the Institute for the Advancement of Social Work Research, a significant number of practice books published in the past two years have the term “evidence-based practice” in their titles. EBP: How Widespread Is it? The question of how widespread EBPs in public behavioral health settings actually are is a difficult one because there are currently no systematic studies measuring its implementation and because the pendulum swings widely when it comes to defining what an EBP actually is. Nevertheless, Soydan believes it is safe to say that EBP in behavioral health settings is indeed on the rise. “I think the infrastructure to develop evidence-based practices has been strongly growing around the globe,” says Soydan. According to him, it started with two knowledge-generating networks of researchers, practitioners, and funders: the Cochrane Collaboration, which produces and disseminates systematic reviews of effectiveness studies in healthcare (including behavioral health) and was launched in 1993, and the Campbell Collaboration, which provides the same kind of systematic review of effectiveness studies in social welfare, education, and criminal justice. “These two have been extremely influential in setting the terms of evidence,” says Soydan. The other major contributor to EBPs’ growth in public behavioral health settings has been the appearance of so-called clearinghouses, or Web-based databases that retrieve the best possible evidence on what works and reframes the information into plain language that end users such as social workers can more easily understand. Despite these available informational and technological resources, the shift in knowledge and practice prompted by the appearance of EBPs is still largely dependent—like all such changes—on the human factor. It’s one thing to research the efficacy of a treatment and make the results public, but it’s another thing to put that treatment into practice. To that end, the National Institute of Mental Health presented a conference in 2007, “Partnerships to Integrate Evidence-Based Mental Health Practices Into Social Work Education and Research.” One of the conference organizers was Denise Juliano-Bult, MSW, chief of the systems research program at the National Institute of Mental Health. 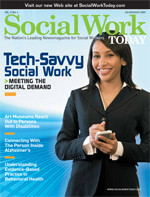 Some schools of social work are taking steps to bridge that gap. The University of Michigan School of Social Work, for example, has begun offering minicourses in EBP to field site supervisors and has made the university library and search engines available to the field sites, so they can more easily research which EBPs to implement in their organizations. Like every change in professional culture, the shift to EBP in behavioral health has met resistance, some of it quite strong, perhaps because this issue cuts right to the heart of a controversy that has been brewing for many years—the actual role of science in the social sciences. Science works with categories and averages; psychotherapists, by contrast, work with individuals. It’s the individual approach that some in the behavioral health field believe may be threatened by the growth of EBP. Some therapists have expressed concern that a “lockstep adherence” to a set of codified treatments may prevent the therapist from exercising his or her own individual judgment of what is best for a particular client, especially when it deviates from the evidence-based model. The proponents of EBP point out that this criticism is based on a lack of understanding of EBP as a process, one in which practitioners apply what is good from the research without being tied to a specific kind of codified treatment. Still, when it comes to ensuring the best outcomes for patients in behavioral health settings, “strict adherence to the manual” may not always be a bad thing. Juliano-Bult points out that when professionals insist on adhering to a manualized treatment, it’s often because that’s the best evidence available. The most obvious way to determine whether a treatment is helpful is by measuring outcomes. When clinical outcomes don’t match outcomes cited in the research, adjustments are needed. For EBP to take hold and flourish in the behavioral health community, its proponents recognize the need to take individual differences into account and integrate those considerations into their approach. While Juliano-Bult recognizes that the debate over EBP is likely to continue, she believes that progress will still be made. She points out that integrating EBP into social work education, practice, and research is still an agenda item for the National Institute of Mental Health. “In the meantime, while people might be in disagreement about the particulars, there’s a lot that can be done to help us achieve the common goal of improving outcomes for clients,” she says.